The evolution of smart technology has considerably changed the outlook in various end-use industries (such as automotive, manufacturing, and construction) in terms of connectivity, money saving, enhanced safety measures, and convenience of the users. The Internet of things (IoT) and the acceptance of connected ecosystem have revolutionized industries such as automotive, infrastructure, agriculture, healthcare, and electronics & semiconductor industries. To hold a significant share in the IoT space, various new technologies (such as NB-IoT, LTE Cat1, and Cat NB among others) are invented and are being adopted by different stakeholders. Also, 5G has emerged as another innovative technology in the IoT space. 5G is expected to enable much faster data transmission capability and help in faster deployment of autonomous vehicles in the near future. The advent of 5G will further enable faster data communication with lower latency, and thus will benefit the eSIM market. This is because, faster communication will enable the eSIM to send and receive data at lower latency and provide better navigation, and more connected devices in smart homes. The global eSIM market is expected to witness a robust growth during the forecast period 2018-2028, due to a wide-scale adoption in automotive telematics for bridging the connection between car and the server. Also, during the forecast period, the use of eSIMs is expected to spread in a range of applications, such as in healthcare, transportation, and residential, among others. The increasing global vehicle production, increasing trend of smart homes, and a growing consumer inclination towards a more connected ecosystem, are some of the key drivers for the growth of the global eSIM market. According to BIS Research analysis, the global eSIM market generated $214.7 million in 2018 and is estimated to grow at a CAGR of 40.70% during the forecast period 2018-2028. Europe dominated the global eSIM market in 2017, followed by North America. However, Asia-Pacific is expected to have the highest growth rate during the forecast period 2018-2028. • What are the trends in the global eSIM market across different regions? • What are the major driving forces that tend to increase the demand for the global eSIM market during the forecast period 2018-2028? 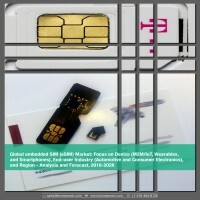 • What are the major market drivers, restraints, and opportunities in the global eSIM market? • What is the revenue generated by the global eSIM market by device, and end-use industry in 2017, and what will be the estimate by 2028? • Who are the key players in the global eSIM market? • What are the major opportunities for the small caliber companies in the next five years? • What is the competitive strength of the key leading players in the global eSIM market? 8.2 Eastcompeace Technology Co. Ltd.
8.12 Wuhan Tianyu Information Industry Co., LTD. The evolution of smart technology has considerably changed the outlook of various end-use industries (such as automotive, manufacturing, and construction) in terms of connectivity, money saving, enhanced safety measures, and convenience of the users. The Internet of things (IoT) and the acceptance of connected ecosystem have revolutionized industries such as automotive, infrastructure, agriculture, healthcare, and electronics & semiconductor industries. Embedded SIM (eSIM) is one such technology which has led to advancements in the connected ecosystem by enabling more secure machine-to-machine (M2M) communication. As per the definition and specifications provided by GSMA, an embedded SIM (eSIM) is a universal integrated circuit card that is embedded on to the device and supports over the air (OTA) provisioning of an initial operator subscription which can be later switched from one operator to another. The eSIM market is growing at a significantly higher rate and is expected to reach $6.53 billion by 2028, due to the increasing global vehicle production and safety measures. Also, an increasing trend of smart homes, connected devices, and consumer inclination to a more connected ecosystem is driving the eSIM market. However, the lack of consumer acceptance for adopting this technology in their day-to-day lives has been a major restraint to the eSIM market. The M2M/IoT device type accounted for the largest market in the global eSIM market in 2017, both in terms of value and volume. This is majorly due to the wide penetration of eSIMs in the automobiles for M2M connectivity. The regulations in place by various governments across the globe, such as the mandate of eCall facility by the European Union in all passenger cars from March 2018, have further fuelled the growth of eSIMs in this segment. The automotive industry accounted for the largest share in the global eSIM market in 2017, both in terms of value and volume. The Original Equipment Manufacturers (OEMs) are increasingly incorporating connected services in all the vehicle categories, owing to their multiple benefits, thereby driving the adoption of automotive telematics that use eSIMs to connect the devices over the internet. After a wide-scale adoption in automotive telematics, the use of eSIMs is expected to spread in a range of applications, such as in consumer electronics, healthcare, transportation, and residential, among others, during the forecast period. Europe accounted for the largest share in the global eSIM market in 2017, both in terms of value and volume. However, Asia-Pacific is expected to grow with the highest rate during the forecast period and, surpass the market of Europe in terms of volume. This is mainly due to lower cost of consumer equipment in the region. Additionally, the rising trend of smart homes in the region is also supporting the growth of the Asia-Pacific eSIM market. The global eSIM market has witnessed various stringent policies by different market players to attain their respective market shares in this emerging domain. Some of the strategies covered in this study are product launches, collaboration, partnerships, and agreements. Some of the key players functioning in this market are Gemalto N.V., Giesecke & Devrient GmbH, IDEMIA, Telit Communications PLC, and Workz Group. Gemalto is one of the key players in eSIM market, since it currently has a strong position in R&D and a wide global presence. For maintaining the position of the company as a leading innovator in the eSIM sector, the company is focused on expanding in Mobile PC platform and has collaborated with Qualcomm Technologies Inc.